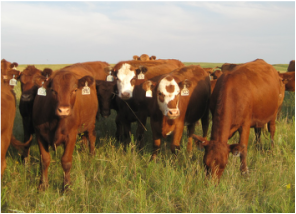 Our cattle are raised on native prairie pastures in central North Dakota. They spend most of their life consuming a diverse mixture of grasses and forbs. We manage for diversity in our rangeland pastures as we know that healthy soils lead to healthy animals, and healthy people. ​During the growing season cattle are rotated to fresh pastures every 1-3 days. In the winter time our cattle graze stockpiled forages or bale graze. Our calves remain on the cow through out the winter until the middle of March . The calves are fence lined weaned using low stress methods. After the calves are weaned we will run them in a separate herd for awhile and eventually return them to the main cattle herd. Running one herd of cattle helps us properly manage our pastures. Calves are born from the middle of May until around July 4th. We like to match our calving cycle to when mother nature is less harsh and the calves can be born on fresh green grass. Calving during spring and early summer lessens our workload and green grass is great for feeding cows. We retain ownership of our calves and run them on grass following grassfed beef protocols. 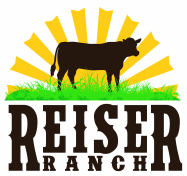 We select our heifers for breeding and ship the other yearlings off pasture to grass finishers or they are marketed as all natural through a local sale barn. A select few of our cattle are reserved to be finished on grass for our grassfed beef customers. Recently we have started finishing cattle on Non-GMO grains. Often when our cattle don't have a certain breeding characteristic, that animal will be finished for slaughter and sold to our customers. Spend most of their life on native rangeland being rotated to fresh new pastures. To be grain finished the final 90-120 days are spent on a ration of barley hulls, green/yellow peas, flax, oats, straw and hay. We have a small number of cattle that are grassfed from birth to butcher. Inventory is very limited. We sell pot loads of 750 weight steers/heifers in September to grass finishers. If your looking to purchase cattle to finish on grass please contact us for more information.